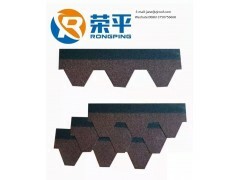 Non-verified -Zhejiang rongping buliding material Co.,Ltd. Description:Mosaic shingles creates a beautiful “mosaic” effect on your roof with its hexagonal Patterns to bring your graceful and peaceful feeling. Mosaic shingles creates an original Play of nuances and lends the roofing system an antique effect. Mosaic is particularly Easy to lay, as the shingles feature wholly self-adhesive strips. While the total adhesion of the strips are a guarantee of Resistance to strong winds and heavy snowfalls. This style is not only suitable for any kind of roofs but also no limit about the slopes.